Ratatouille left me with mixed feelings. It was not one of my favorite Pixar films (Finding Nemo, The Incredibles, Toy Story 2) which I could watch over and over (and have), but its wasn't one of my least favorite Pixar films (Cars, Toy Story) either. As I wrote previously, I went to see Ratatouille feeling very favorably disposed towards it - anticipating the scenery of Paris, an unusual hero, French food, and the theme of creativity. I wouldn't say I was disappointed... well, sort of. To me, the film seemed very uneven. Scenes of frenetic activity (mostly involving rats trying to get away) were interspersed with scenes which occasionally seemed to drag. Younger son got restive at one point which has never happened in a Pixar film before. There were touching scenes that I loved and way too much slapstick which I don't really care for. Remy is an unlikely hero. He's a lover of fine cuisine who doesn't fit in with his garbage-eating family. Through a series of accidents, he ends up being one of the chefs in a Parisian gourmet restaurant which has seen better days. You can guess the ending from that. Sort of. My favorite aspect of the movie, and the aspect which will get me to eventually see it again in the second-run theater, was the visual aspect. 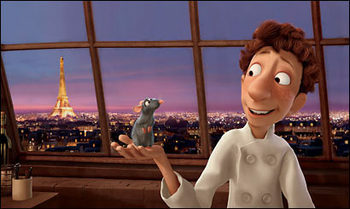 Ratatouille is the most beautiful computer-generated movie that I've seen, for instance, scenes with the wind blowing on Remy's greyish-purple fur, the scenes of the food and the restaurant, and, most of all, the scenes of Paris. At one point, a pen falls to the floor. Beautifully. The movie is a visual feast. Character-wise, however, I didn't get absorbed in it. Unlike many other Pixar movies, this one did not have a group of friends/sidekicks with distinctive voices and personalities (such as the hockey puck, pig, and dinosaur in the Toy Stories, the other vehicles in Cars, or the other arthropods in A Bug's Life). The movie does creatively and uniquely introduce the other members of the kitchen staff, but then drops them as individual characters. SPOILERS FROM THIS POINT ON! DON'T READ IF YOU DON'T WANT TO KNOW PARTS OF THE PLOT! That would be fine if, as in the Incredibles, the main characters were compelling enough to carry the movie. Remy did his part, but the other main characters (Linguini, the chef Remy helps, Collette, another chef and eventual love interest, and Skinner, the bad guy chef, who reminded me of a cross between a monkey and Edna Mole (from the Incredibles)) didn't really grab my interest. Linguini, until the end, seemed part-incompetent and, occasionally, part-jerk. Collete had a great start as a fierce personality who worked her way up in the competitive and sexist world of French gourmanderie, but then she...fell for Linguini? She's that desparate?! The bad guy wasn't all that competent either. No wonder the rat won. There's one other exception to the lack of character - Anton Ego, the food critic and other bad guy (sort of) who, in a wonderful scene, is redeemed by a rat. Wonderfully voiced by Peter O'Toole, he was quite grim (although I thought the coffin-shaped office and skull typewriter were overkill), for instance, saying to Linguini, as he orders his dinner, "I believe I will have your heart roasted on a spit." Remy's "inner Gusteau" who guided him through the film: "How should I know? I'm only a figment of your imagination!" I don't usually notice the scores of animated movies. I noticed this one, and it was very good in helping to set the tone of the scenes. Remy's love/frustration relationship with his father and especially his brother. Various views Remy gets of Paris spread out before him. The scene where all the rats are cooking. I want to see this again, on the large screen, but with my own pause button, so that I can get more of the details. The way Linguini calls Remy "little chef." One more note. I've read numerous reviews, articles, and blog posts on Ratatouille, and, given that it takes place in France, I'm amazed that I have run across very few writings that mention the parallels to Cyrano de Bergerac. Because of his looks, Cyrano had to romance Roxanne (not bright enough to love someone with a big nose?) through Christian (not bright enough to be able to romance Roxanne himself). There's the scene where Christian decides to goes it alone and botches it. He dies before he gets a chance to honestly tell Roxanne that Cyrano was the one behind the wonderful love letters he sent her. Because of his looks, Remy has to cook through Linguini. We can skip the romance part which just seems tacked on and isn't relevant to Remy anyway* When Linguini has to go it alone, he botches it, but, since he doesn't die before the end of the story like Christian does, Linguini has a chance to tell everyone who is really behind the beautiful dishes he created. Which leads to all of the minimally characterized kitchen staff leaving. Linguini's painful honesty redeems his rather one-dimensional character. Sort of. Even with a less-than-bright supporting cast (Roxanne and Christian), Cyrano, himself, has enough panache and poetry to carry a play. On the other hand, Remy, with a less-than-bright supporting cast, is still a sweet little rat who likes cooking. A whole movie seems a lot to lay on his little shoulders. Did I like it? Did I dislike it? * Pixar doesn't usually include romance. Maybe this movie shows why. The only other Pixar film with a central romance, Cars, played out an American formulaic story - big shot goes to small town, falls in love with local girl, and is redeemed by his realization of the value of small-town mores. The other Pixar movies had touches of romance, but they're peripheral to the story. The romance in Ratatouille doesn't seem the slightest bit believable to me. Colette can go from saying the dialog below to being in love with the bumbling, minimally-personalitied Linguini in a matter of days (or weeks, it's not clear)? Colette: [pins Linguini's sleeve with another knife] Only me. Why do you think that is? Because high cuisine is an antiquated hierarchy built upon rules by stupid, old men. Roof designed to make it impossible for women to enter this world, but still I'm here. How did this happen?